How much does it cost to play all the various games? Check out our cost of entry brochure for other pricing options. What time do the draws close for each game? What is the difference between the various games? In Saturday, Monday and Wednesday Lotto you need all six Winning Numbers to win Division 1 and in OZ Lotto you need all seven Winning Numbers to win Division 1. Powerball is played by drawing seven balls from the first barrel of 35 and one ball from a second barrel of 20. The number drawn from the second barrel is the Powerball number and all eight numbers together are the Winning Numbers. Set for Life is a game with draws every day of the week. When you win 1st Prize, instead of a single lump-sum payout, you get an ongoing prize of $20,000 a month for 20 years and it's guaranteed (if won) for up to four winners. Each entry lasts for seven consecutive draws and is played by drawing ten numbers from 37. The first eight numbers drawn are the Winning Numbers and the last two drawn are the Bonus Numbers. Why do some games jackpot? For some games, if there is no Division 1 winner for a draw the provisional prize pool is rolled over to the next game, increasing the jackpot. Saturday Lotto, OZ Lotto, Powerball and Super66 are all examples of such jackpotting games. How do I learn to play all the various games? The game information pages on our website are full of information about how each game is played. You may also like to learn the various ways to play those games or read the how to play brochure for detailed information. If none of that helps, give us a call and we'd be happy to help you through it. How do Scratch'n'Win games differ? $1 and $2 games are fun, easy and quick to play - great if you've only got a few spare moments to try your luck at cash prizes up to $20,000. $3 games take a little longer, like our ever-popular Word Play ticket. Simply scratch to reveal each letter, then match that letter wherever it appears in the Word Play panel(s) to make three or more complete words. $5 games offer a wide variety of game styles, all with the chance to win up to $100,000 cash. Our light gaming style tickets (such as Roulette, Poker and Blackjack) offer great returns and a bit of a challenge. Our "time out" $5 Word Play offers the same great mechanic as the popular $3 Word Play with even more play value. In addition to these, other multiple-panel games are on offer at various times throughout the year to offer a fun and easy play mechanic with great cash prizes to be won. $10 games offer fantastic value with great odds, high prize payouts and the biggest top prize offering of up to $300,000. $20 games are our premium tickets and are packed with play value. These games are simple to play, offer a large prize pool, have great odds of winning and multiple top prizes. How do I know I've won a Scratch'n'Win prize? For some Scratch'n'Win games you need to match three dollar amounts or symbols in each game panel. Other games have a lucky number mechanic where you require only one number match to win. There are also Word Play and Bingo as well as many other different games. Make sure you read the play instructions carefully to check the rules for each game. If you’re not sure if your ticket is a winner, you can check it using the ticket checker at any Lotterywest store, or ask your local retailer to check the ticket for you. They’ll scan the ticket barcode on the terminal, which will instantly advise if your ticket is a winner. If the retailer doesn’t have a terminal they can ring Lotterywest to verify your win. What Scratch’n’Win prizes have been won recently? Scratchie winners win! Refer to the scratchie winners table for a full list of our lucky top prize winners. All Scratch’n’Win tickets are computer generated and printed under strict security conditions. Each ticket in each game is unique. The printing process ensures that no ticket can be tampered with, altered or mistreated in any way to reveal the game underneath. The latex is also designed to disintegrate on scratching to retain the integrity of each ticket. When do the Scratch’n’Win prizes expire? Prizes may be claimed in all Scratch'n'Win games for up to 12 months from the date the last book of tickets was issued from Lotterywest for sale. Prizes may not be claimed after the expiry date. In accordance with the Lotteries Commission Act any unclaimed prize money is distributed to WA community organisations via Lotterywest’s Direct Grants Program. To find out how much time you've got left to claim your prize, refer to the prize expiry table to see if an expiry date has been set. Can I purchase Scratch'n'Win tickets online? No, Scratch'n'Win tickets are not able to be purchased online. Find your nearest Lotterywest store to purchase a ticket. How can I be part of a syndicate? Visit a Lotterywest store to buy a share in a syndicate. Simply ask what shares are available for the game you want to play or how much you would like to spend. If you have a Lotterywest membership, make sure you register your ticket against it so your winnings are automatically paid out to it. You can create your own syndicate with friends and family. Start by downloading the Syndicate Planner and select the game and ticket options you want to play. Then you're ready to visit your local Lotterywest store and fill in a playslip or ask for a Slikpik. Ask the retailer to print a valid share ticket for each syndicate member. This gives each person the peace of mind and convenience to claim their share of prizes on winning entries themselves. You can read more about syndicates here. What are some tips for playing syndicates? The syndicate planner makes keeping your records easy. All syndicates need at least five shares at a minimum cost of $5 each. This means all syndicates have a minimum total cost of $25. What types of System entries are there? Increase your chances of winning a prize by reducing how many Winning Numbers you need to have on your ticket. For example, a System 4 Saturday Lotto ticket will only require the four numbers on your ticket to be chosen as Winning Numbers in order to win Division 1. The other two numbers are guaranteed with this ticket type. Increase your chances of winning a prize by getting more numbers in each game or SET. How can I play Systems? A System entry allows you to play up to 20 of your selected numbers, and every possible combination of those numbers. For example, select six numbers to play a System 6 entry, select 18 numbers to play a System 18, and so on. You can choose your own numbers on a playslip or ask for a Slikpik or Set for Life QuickSET. How does a System entry work? Select any eight numbers between 1 and 45, for example: 1, 2, 3, 4, 5, 6, 7 and 8. Your System 8 entry will contain 28 games, each with six number combinations of your selected eight numbers. Your ticket will only display your eight chosen numbers, however your entry actually has 28 games. Winning System entries pay multiple prizes because each game contains a similar pattern of numbers. For example, if the numbers 1, 2, 3 and 4 are among the Saturday Lotto Winning Numbers, games 1 to 6 would each be eligible for a prize. Joining a syndicate is a great way to play Systems! A syndicate is a group of lottery players who share the cost of a Lotto ticket to play more games and increase the chances of winning. How do I play Systems for Saturday, Monday and Wednesday Lotto? With fewer numbers System entries, your selection of numbers is then combined with all remaining numbers (1 to 45) to create every possible six digit combination containing your selected numbers. More numbers System entries use your selection of numbers to create every possible six digit combination containing your selected numbers. View the Lotto Systems table. How do I play Systems for OZ Lotto? With fewer numbers System entries, your selection of numbers is then combined with all remaining numbers (1 to 45) to create every possible seven digit combination containing your selected numbers. More numbers System entries use your selection of numbers to create every possible seven digit combination containing your selected numbers. View the OZ Lotto Systems table. How do I play Systems for Powerball? Mark the System number you wish to play on a Powerball Playslip. Then mark the Pick 7 section of the game board with the appropriate number of numbers for the System (8 numbers for System 8). Mark one number in the Pick 1 section for the Powerball number. Ask for a Powerball System Slikpik in-store and a ticket will be issued with randomly generated numbers for you. Log in to your Lotterywest membership to choose your own numbers or request a Systems Slikpik. With fewer numbers System entries, your selection of numbers is then combined with all remaining numbers (1 to 35) to create every possible seven digit combination (plus your Powerball selection) containing your selected numbers. More numbers System entries use your selection of numbers to create every possible seven digit combination (plus your Powerball selection) containing your selected numbers. View the Powerball Systems table. A Powerpik System entry contains all 20 numbers for the Powerball so you only need to match the seven Winning Numbers drawn from barrel A. Powerpik System entries are available for Systems 5 and 6 and Systems 8 to 14. View the Powerpik Systems table. How do I play Systems for Set for Life? Mark the Systems number you wish to play on a Set for Life playslip. Then mark a SET with the appropriate number of numbers for the System (5 to 7, or 9 to 20). Ask for a Set for Life System Slikpik in-store and a ticket will be issued with randomly generated numbers for you. With fewer numbers System entries, your selection of numbers is then combined with all remaining numbers (1 to 37) to create every possible eight digit combination containing your selected numbers. More numbers System entries use your selection of numbers to create every possible eight digit combination containing your selected numbers. View the Set for Life Systems table. What do System entries cost? System entries cover multiple combinations of numbers so they cost more than a normal entry. Check out our cost of entry brochure to find out what it costs to play a System entry in your favourite game. How do I buy a Combo Pack? Combo Packs are available exclusively in-store and are an easy way to play most of your favourite games throughout the week. Choose the option suited to your budget and your retailer will print a ticket for each game included in your chosen Combo Pack and give you all the tickets. Make sure you have all the games before you leave the store! What are the benefits of Combo Packs? What games are in the Combo Packs? Ask in-store to see which games are in the different Combo Pack options. Can I change the games in a Combo Pack? The combination of games in a Combo Pack is fixed. If the combination contains a game that you do not wish to play, you may like to purchase the games separately instead. Can I play my favourite numbers in a Combo Packs? All Combo Pack tickets are Slikpik or QuickSET entries so there’s no need to fill in a playslip. What days can I purchase a Combo Pack? Combo Packs can be purchased any day of the week. The pack will include a ticket in every game included in the pack for the seven days from the day of purchase. When can I claim my prize? As each Combo Pack contains a separate ticket for each game so you can claim your prize the day following that draw. Simply take your ticket in-store and remember to hold on to the remaining tickets in your pack until all the draws are complete. Do games cost more in a Combo Pack? The cost of each game is the same in the Combo Packs as they would be if you bought them separately; we've just packaged them up for your convenience. Can I purchase Multiweeks or Advance Play with Combo Packs? Unfortunately not but you are able to purchase a Combo Pack and choose to start any day within the next seven days of your purchase. Are Combo Packs available as a Syndicate? Unfortunately, syndicate options are not available for Combo Packs. Can I register my tickets with Combo Packs? Yes, you can register your tickets using your Lotterywest membership. What information do I need to join as a Lotterywest member? To register as a Lotterywest member all you need is an email address and some documents to help us verify your identity. We use a third party identity verification service provider that validates your identity against various databases such as WA driver's licence, White Pages, WA Electoral Roll, Medicare and Australian passport records. This service is completely secure and helps us confirm you to be aged above 16 years and a resident in WA. Once your identity has been verified you will be sent a temporary password via email so that you can access your account and start playing. Click here to find out more and sign up today! Can I let anyone else use my Lotterywest membership? No. In the ‘Terms and conditions’ you accept when you register for your Lotterywest membership, you agree to not share your account details, password and/or PIN with anyone. If I register as a Lotterywest member will I be added to a promotions email list? When you register for a Lotterywest membership you can choose whether you want to receive information about jackpots, Superdraws and promotions by leaving the appropriate box ticked. If you leave this box ticked you will occasionally receive emails from Lotterywest about these events. If you clear this box you will only receive emails related to your account activity. You can change this option at any time by clicking 'My account' when accessing your Lotterywest membership via the Lotterywest website. Is there an age limit to play? Yes, you must be 16 years or older to play (and be able to prove your age at registration). Can I register and play if I don’t live in Western Australia? You must have a Western Australian residential address to register for the Lotterywest membership. PO Boxes are not accepted as a residential address. If you are temporarily located outside of Western Australia you need to check if the laws in that region allow you to purchase lottery tickets online. Why do I have to complete an identity check? By law we are required to verify the identity of players registering for a Lotterywest membership. Proof of identity is required to ensure all players meet these criteria. Identity verification is the process of checking a player’s personal details against a set of data sources such as the White Pages, WA Electoral Roll and WA Driver's licence databases. This is done to ensure players identities and that the age and address requirements of becoming a registered player are met. This process is carried out by a Third Party Identity Verification Service Provider. Registering and verifying your identity online is completely secure. Are my details shared with anyone else? The details you provide to us are shared with our secure Third Party Identity Verification Service Provider for the purpose of verifying your identity. The personal details in your account will be kept secure and used to contact you about your account if it is necessary. You will not be sent promotional emails unless you opt to receive them. Can I receive prizes paid by cheque? Lotterywest similar to many other Government organisations such as Medicare and the ATO has replaced cheque payments with EFT. For Lotterywest members, that means you’ll need to provide us with your bank account details. To arrange this, all you need to do is complete this change of financial details form. Please rest assured your details will be kept confidential and secure. Once we receive your information we will update your account as soon as possible. What are the online operating hours? You can access your Lotterywest membership online 24 hours a day, 7 days a week. Prize payments may be delayed during public holidays. Draws close at varying times depending on the game and the time of year. See the games section for more information. Online entries will be disabled one minute prior to draw close for each game and draw. Is there a difference in the cost of purchasing tickets online compared to in-store? No. All tickets cost the same regardless of whether you purchase online or from a Lotterywest retailer. Where does the money go from the sale of lottery products online? Whether you purchase in-store or online, approximately one third of every dollar goes back to the WA community through health, sports, arts, charitable and community organisations. About 60 cents in every dollar goes to player prizes. Less than 10 cents in every dollar is used for Lotterywest's operating expenses. Can I cancel an entry? No. After you have confirmed your online entry, there is no facility for you to cancel your own entry. When purchasing entries online you will be prompted to confirm your purchase prior to finalising each transaction. When you are in the ‘Confirm your purchase’ screen, check that you have the correct details before you click ‘Purchase’. Your Lotterywest membership allows you to save your own numbers so you don't have to choose them every time you play. To save an entry as a favourite, select the game and then ‘Create a new entry’. Create your entry and then tick ‘Save as favourite’, name your favourite numbers and then purchase your entry. You can delete and rename your favourites in the ‘Favourites’ screen. To save an entry as a favourite, go to ‘My favourites’, click on the ‘+’ button at the top right corner of the screen and create your favourite by following the prompts on screen. Favourite Games will only be saved locally to the device you are accessing the Lotterywest App through. To play a favourite, go to ‘My favourites’ and click the play button of the favourite you want to play. Complete your purchase by following the prompts on screen. You can delete and rename your favourites in the ‘My favourites’ screen. Where can I find out about Lotterywest games, prize divisions and odds of winning? You can find information in the games section of our website and in our Lotterywest App when you select draw results, then the specific game. Why are there spend limits and what happens if I reach my spend limit? Lotterywest has set a maximum spend limit of $500 per week to promote responsible play, however you should only spend what you can afford. You can also reduce your own spending limit to ensure you do not exceed your budget. Visit our Play Responsibly page for more information. Can I play if I’m overseas or interstate on holiday? You must have a current Western Australian residential address to be a Lotterywest member and purchase tickets online. If you are temporarily located outside of Western Australia you need to check if the laws in that region allow you to purchase lottery tickets online. Where can I view my entry details? To check your entries, go to ‘Check entries’ (‘Check my tickets’ via the Lotterywest App). You’ll be able to view details and see the status of entries you have purchased and prizes you have won. How do I print my entry? At the time of purchasing your online entry, click on ‘print a copy’ to print out the entry. To view your purchase history, go to ‘My e-wallet’ (‘Manage my e-wallet’ via the Lotterywest App) and click on ‘Transaction history’. Where can I view my winnings history? To view your winnings history, go to ‘Check entries’ (‘Check my tickets’ via the Lotterywest App). How do I log out of my Lotterywest membership online? Select 'Logout' from the top of the screen. What happens if my internet connection disconnects while I am purchasing my entry? Unless you have confirmed your purchase by clicking ‘Buy Now’ before the disconnection, the transaction will not have been completed. You can confirm by clicking on the ‘Check entries’ link to see if your latest purchase has appeared. What do I do if I am having difficulty viewing the website in my current browser? If you are having an issue with a particular browser/platform from the list above please contact us and let us know the details. How do I change my contact details (address, telephone, email) online? To change your contact details, go to ‘Edit details’ (‘Edit my account’ via the Lotterywest App), click on ‘Contact’ and follow the prompts. How do I add or change my financial details online? To change your financial details, go to ‘Edit details’ (‘Edit my account’ via the Lotterywest App), click on ‘Financial’ and follow the prompts. To close your account, go to ‘Edit details’ (‘Edit my account’ via the Lotterywest App), click on ‘Close account’ and follow the prompts. You can close your account at any time, as long as all lottery draws in which you have purchased an entry have taken place and your account balance is reduced to zero ($0.00). How do I close my account if I still have a balance in my e-wallet from a credit card deposit? There are restrictions on withdrawing balances from a credit card deposit. Please contact us to assist you further. How do I change my weekly spending limit? To change your weekly spending limit, go to ‘Edit details’ (‘Edit my account’ via the Lotterywest App), click on ‘Personal limit’ and follow the prompts. You can change your weekly spending limit at any time, but it must remain under the $500 Lotterywest limit. Can the financial institution account that I nominate be in joint names? You can use a joint account as long as you are one of the named account holders. How much can I deposit into my account? You can deposit between $10 and $500 at a time into your e-wallet. There is no daily or weekly limit – the limit only applies to individual transfers. However your e-wallet can only contain a maximum of $5,000. Once your e-wallet balance reaches $5,000, you will not be able to purchase entries until you withdraw funds and reduce your e-wallet balance below $5,000. How do I deposit money into my e-wallet? Whether you're topping up your account or looking to buy a ticket straight away, there are several ways you can securely transfer funds into your e-wallet. You can deposit funds via credit card (*fees may apply, instant transfer), debit card ($0, instant transfer) or bank transfer (*fees may apply, instant transfer). Please note: *Some banks charge a small fee for transactions and some credit card providers charge a cash advance fee for lottery transactions. Contact your financial institution for details on how they charge for different payment methods. The minimum deposit is $10 and the maximum deposit is $500. The maximum amount of funds that can be held in your e-wallet is $5,000. If your e-wallet balance exceeds $5,000 you will not be able to play until your balance has been reduced to $5,000 or less. Funds transferred into your e-wallet via credit card can not be withdrawn. What are the fees for using BPAY®? Is a credit card deposit treated by my financial institution as a ‘purchase’ or as a ‘cash advance’? This depends on the financial institution. Some financial institutions may treat a transfer by credit card as a cash advance. Interest and fees would then be charged from the time of transfer. In addition, some credit card issuers may not allow funds transfers to a lottery website. Check with your financial institution for more information. What is the 'Security Code' on the Deposit (cash in) credit card page? The security code (often referred to as the 'CVV' - credit card validation value) is found on the back of your VISA or Mastercard credit card. Where the three digit security code is not shown on its own, it is normally the last 3 digits on the back of your credit card. To complete your funds deposit transaction, simply enter the three digit security code from the back of the credit card that you are using. This code is used as additional security for your credit card transaction. How long does it take for my transfer from my credit card or financial institution account to show up in my e-wallet? Usually a transfer from your credit card will appear immediately. A BPAY® transfer can take from one to three working days. You can withdraw funds from your e-wallet that you have won or deposited via BPAY®. The funds withdrawn will be transferred into your nominated financial account. You cannot withdraw funds that you have transferred from your debit or credit card to your account. How long does it take for funds to be transferred from my e-wallet to my nominated financial institution account? Any funds withdrawn from your e-wallet and deposited into your nominated financial account will take one to three working days to appear. Have I received a scam email? Purchasing through the Lotterywest website or app is safe and secure, however internet scams do exist. If you receive an email which sounds too good to be true, it probably is. Unauthorised overseas operators send mail and emails to people throughout the world claiming to be Lotterywest. These scams often claim the recipient has won a large prize and should send further details or money (sometimes called a handling fee) for the prize to be paid. Lotterywest does not charge any handling fees for prize payouts. We will never ask you for your password via email. If you wish to check if a message you have received is from Lotterywest please email or call us. What do I do if I forget my PIN for the Lotterywest App? You can reset your PIN by selecting ‘Log in’, then ‘Reset my PIN’. You will need to enter in your email and password to set up a PIN. If you enter your PIN incorrectly five times, you will be prompted to set up a new one. How can I change my Lotterywest App PIN? You can change your PIN by selecting ‘Log in’, then ‘Reset my PIN’. You will need to enter in your email and password to set up a PIN. If you enter your password incorrectly five times, your account will be locked. You can reset your password by clicking on the ‘Forgotten your password?’ link. You will need to correctly answer your security question before a temporary password will be emailed to you. When you log back in you will be prompted to create a new password. How secure is purchasing Lotterywest tickets online? Lotterywest has processes in place that ensure your identity and financial details are secure. We use an Extended Validation Certificate (EV), a X.509 public key certificate issued according to a specific set of identity verification criteria to secure your online transactions with us. To obtain an EV, Lotterywest underwent extensive verification by the Certificate Authority (CA). The EV signifies that Lotterywest has passed an identity authentication process. Lotterywest has been issued an Extended Validation Certificate by a CA under the EV guidelines, and with a CA-specific policy identifier so that EV-aware software can recognise the certificate. The EV will trigger your browser address to display a green bar that when clicked on will display Lotterywest's company name and address (the organisation that owns this website). This signifies that you are dealing with Lotterywest. You can click on this bar to display a message box which confirms that Lotterywest is 'Identified by Thawte', the certificate authority that issued this EV Certificate. A padlock should appear in this message box. This confirms that your connection to our site is encrypted and secure. The security and safety of your Lotterywest membership account is a priority for Lotterywest and it is important that you protect yourself from possible fraudulent activity. What security is in place for my credit card payments? We use an Extended Validation Certificate (EV), a X.509 public key certificate issued according to a specific set of identity verification criteria to secure your online transactions with us. We will not access your credit card details. Your credit card details will not be part of our operating system. All credit card transactions are processed by BPOINT via the Commonwealth Bank of Australia. What should I do if I think someone has accessed my Lotterywest membership without my knowledge? What should I do if I think my account details have been compromised? What can I do to keep myself safe when using my Lotterywest membership online? What are the best ways to keep my password and PIN secure? What devices can you download the Lotterywest App on? Why can’t I purchase tickets using the Lotterywest App? To purchase tickets through the Lotterywest App, you will need to be a Lotterywest member. Learn more about becoming a Lotterywest member here. If you're already a member and are unable to purchase lottery products, please contact us. Players using the Lotterywest App on an Apple device must have their location services turned on and be in Australia when accessing the App. If you are outside of Australia you will still be able to purchase tickets through the Lotterywest website if the laws in that region allow you to use purchase lottery tickets online. How do I enable location services on my iOS device? You may need to restart the Lotterywest App for these changes to take effect. How do I download and install the Lotterywest App on my Apple device? Visit the Apple Store and follow the prompts to download the free Lotterywest App. Alternatively you can go directly to the Apple Store on your mobile device and search ‘Lotterywest App’. Select the ‘Get’ button which will download and install the App onto your Apple device. Why can’t I download the Lotterywest App from the Google Play Store? We are unable to list the Lotterywest App in the Play Store due to Google’s restrictions on lottery apps. We do however have our Lotterywest Lite App which can be accessed here. Simply download the lite app and follow the instructions to set up the full Lotterywest App. Rest assured that by following the download and installation instructions, the app will be accessible and ready for use. How do I download and install the Lotterywest App on my Android device? You may have noticed that our Lotterywest App is not in the Play Store. We do however have our Lotterywest Lite App which can be accessed here. Simply download the lite app and follow the instructions to set up the Lotterywest App. Alternatively we've put together this easy step-by-step guide to assist you in installing the app on your compatible Android device. How do I download and install a Lotterywest App updates on my Android device? You may have noticed that our Lotterywest App is not in the Play Store. Lotterywest are unable to list the Lotterywest App in the Play Store due to Google’s restrictions on lottery apps. Therefore there are a few more steps when downloading the app for the first time, as well as when there is an update to the app. The below instructions will guide you through how to update the app. 1. Notification: when you click on the Lotterywest app you may be notified that there is a new version available for download. Please note: if you press skip, you’ll be reminded again in a few days. 2. Download: after you click ‘download’ the file may appear in your notifications from ‘Download Manager’. Click on this file to download it. 3. Security Settings: your device may prompt you to update your security settings to allow ‘unknown sources’. This will allow you to install the update. If you accidentally click ‘cancel’ simply access this setting in ‘Settings’ or 'Device administration' (which may be under 'Security'), tick the box for 'Unknown sources'. Then go back to your notifications and click on the downloaded file. 4. Install: Select 'Install' when prompted. 5. Launch: Visit App Launcher to access the app - you can then choose to save it on your home screen for quick access. How do I uninstall the Lotterywest App on my Apple device? To uninstall the Lotterywest App, hold down on the app icon until an X appears in the corner. Select the X and the app will be removed from your device. This will not close your Lotterywest membership. How do I uninstall the Lotterywest App on my Android device? To uninstall the Lotterywest App, hold down on the app icon in the apps screen and drag it to the trash can. This will not close your Lotterywest membership. How do I logout of the Lotterywest App? Select ‘Logout’ from the menu which swipes out from the left side of the screen. What are Lotterywest App notifications? Lotterywest App notifications are a new feature that send reminders to your mobile or tablet device on upcoming draws or special events. They’re an easy way for you to keep track of your favourite games – and you can customise which notifications you’d like to receive. How do I set up Lotterywest App notifications? How do I stop receiving Lotterywest App notifications? 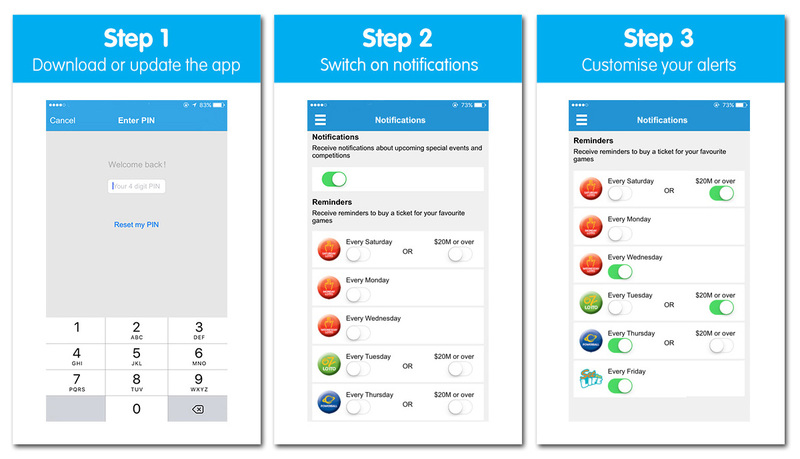 To turn off Lotterywest App notifications, go to ‘Notifications’ and follow the prompts. The toggle will be grey when notifications are turned off. How can I turn on Lotterywest App notifications? If you would like to turn on Lotterywest App notifications at a later time, you may need to update your permissions. For iOS devices navigate to your Settings menu, click on Notifications, then locate Play Online (the Lotterywest App). From here you can swipe the toggle button to turn notifications on. After you’ve selected this, open the Lotterywest App and then choose the Notifications option in the menu to be able to select the notifications and game reminders of your choice. For Android devices, you should be able to choose your notifications directly through the Lotterywest App. However if this does not work, open your Settings menu, then Sound and Notification, and then App Notifications. Find Play Online (the Lotterywest App) and check that ‘Block all’ is not enabled. How can I replay the Lotterywest App tour at a later time? Yes you can. To do this, go to ‘Settings’ and press the ‘Replay tour’ button. How do I change my email address to receive results? To receive Lotterywest emails to a different email address, unsubscribe your current email address by clicking the “unsubscribe” link on the bottom of any Lotterywest communication. Then simply visit our subscribe page to re-subscribe using your new email address. If you are a Lotterywest member, you can update your email address directly by logging in and editing your account details. How do I check if I've won after purchasing in-store? If you've purchased your ticket in-store you can see if you’re a winner by using the in-store ticket checker. They’re easy to use and you can find them in all of our stores. Simply scan the barcode, then wait for the beep and the message to follow. Check just one, or go to town and check them all! How do I know if I've won when purchasing online? After the draw, go to ‘Check entries’ (‘Check my tickets’ via the Lotterywest App). Can I take my online entry to a Lotterywest retailer to have it checked? No. Only tickets purchased at a Lotterywest retail outlet can be checked at an outlet. Winnings from your tickets purchased online will be credited to your e-wallet. To check your entry, go to ‘Check entries’ (‘Check my tickets’ via the Lotterywest App). What if I've won a prize up to and including $500? Prizes up to and including $500 can be collected from any Lotterywest store if you have purchased a physical ticket. For online, self-serve kiosk or app purchases, your winnings will be paid directly into your e-wallet or nominated financial account. Read more on our Collecting Your Prize page. What if I've won a prize over $500 (excluding Division 1)? For physical ticket purchases, these winnings can be claimed at Lotterywest Head Office during office hours, or from our payout centre at Doogues Newsagency in the Murray Street Mall, Perth. Lotterywest can pay up to $2,000 via EFTPOS and Doogues can pay prizes over $500 via cheque. Alternatively, prizes can be paid directly into your bank account when you provide your BSB and account number. Unfortunately we are unable to pay prizes in cash. For online, self-serve kiosk or app purchases, your winnings will be paid directly into your e-wallet or nominated financial account. Read more on our Collecting Your Prize page. What if I've won a Division 1 or top Prize? Top prizes must be claimed at Lotterywest Head Office during office hours. All Division 1 and 1st Prizes are subject to a 14 day validation period. To claim a Division 1 or 1st Prize, you must present at Lotterywest head office within twelve months of the draw. Bring with you a printout of the details of the winning entry and information which will confirm your identity and place of residence. Read more on our Collecting Your Prize page. Where can I go if I think I need help with problem gambling? Gambling Help Online is a national website providing comprehensive information and online support services for problem gamblers and their families and friends. It also provides an anonymous self-assessment questionnaire which will help you assess if your playing behaviour is putting you and your family at risk. Visit www.gamblinghelponline.org.au or call the Gambling Helpline on 1800 858 858. Lotterywest also works in partnership with Centrecare in Western Australia to provide local support services for Gambling Help WA. Centrecare’s Gambling Help WA is a free service for people affected by problem gambling, their partners and families. It offers a supportive environment to talk about the impact that gambling has on their lives as well as the opportunity to learn new ways to manage their behaviour. Regular counselling sessions are offered to individuals, their partners or family members to discuss concerns about their gambling behaviour. People wishing to gain skills and confidence to control gambling behaviour in a supportive group environment may access this program. The group program is run over 10 weeks and provides participants with the opportunity for personal development, insight and learning through structured exercises. Centrecare aims to provide a respectful and culturally sensitive service and interpreters are available on request. Talking to someone is easier than you think. To make an appointment in the Perth metropolitan area, phone 08 9325 6644 and ask to speak to the Client Liaison Officer. In the Southwest please call the Bunbury office on 08 9721 5177, in Kalgoorlie please call their office number of 9080 0333 or if you are in Esperance please call 9083 2600. For 24 hour telephone support, please contact the Gambling Helpline on 1800 858 858. This is a free call and will not be listed on your telephone account. Day and evening appointments are available. How do I self-exclude from playing online? Login to your account, click on ’Edit my details’ on the right hand side of the page then click on ‘Personal limits’. Select ‘Exclude’ in the Self-exclusion section and then the period of time you would like. Once you have selected a period of self-exclusion you cannot change the period of time until that time has elapsed. Can I set a personal spend limit online? Yes. If you are logged in, click on ’Edit my details’ on the right hand side of the page, then click on ‘Personal limits’ to change your weekly spending limit. You can change your weekly spending limit at any time, but it must remain under the $500 Lotterywest limit. If I self-exclude online, can I still purchase lottery products at a retail store? Yes, the purchase of lottery products within WA from a retail store is still possible. Not-for-profit organisations and local government authorities can apply for Lotterywest grants. Not-for-profit organisations can range from small unincorporated groups to large multi-functional organisations. Individuals, profit-making organisations and Government organisations are not eligible to apply. Lotterywest grants can support charitable or benevolent purposes. We will work with you to try and support your initiative or explore if there are other initiatives we can support your organisation with. The promotion of sport, including equipment or a vehicle that will support sporting teams or travel for sporting teams, is not a charitable purpose. Grants for sporting organisations may be supported if a charitable purpose can be identified such as providing sporting activities for people with disabilities or the elderly, where social outcomes will be achieved, or where sport is used as an engagement strategy. Activities and assets that are core school responsibilities (e.g. playground equipment for schools or education materials) are not able to be supported. There may be scope to support projects linked to schools that meet a community-identified need. Parents & Citizens associations (P&Cs) can apply for suitable projects. Schools are not eligible. Interstate or overseas projects are not eligible. An organisation’s ongoing operating costs are not able to be supported. Project costs may be supported as they are time limited. The welfare and community service activities of faith based groups can be supported as long as they are not of a religious nature. Costs associated with the core delivery of a service purchased by local, State and/or Federal Governments are not able to be supported. Please call us if you'd like to check your idea for a grant and whether there is any scope for us to provide support. We accept applications from $3,000 upwards. Please don't under or over estimate your request. Apply for the amount that will serve the need properly. There are limits for unincorporated groups and organisations not GST registered. The limit is a combined total of up to $15,000 for each financial year. How much of my request will Lotterywest support? We do not have set amounts, however we would not expect to be the only source of funding. We expect to be a complementary funder. We anticipate that most organisations will make a contribution from their own resources, whether financial or in kind. We can offer ideas to help you to combine our grant with other sources of support. What if the request is for items that relate to services that are purchased by government? Are there any grant conditions? All organisations are required to agree to the Lotterywest Conditions of Grant. If you are applying for a community spaces or community and workplace buildings grant, special conditions may apply. Please note: The clauses listed in these documents are provided as a guide. Further conditions may apply to your grant and these would be communicated in your grant approval advice letter if a grant is approved. Can retrospective requests be considered? We can’t provide grants to cover items or expenses incurred prior to grant approval unless exceptional circumstances apply. Call us before you make an application if you believe exceptional circumstances apply. If your application is complete when you submit it to us, it will generally take three months to progress to the Lotterywest Board for consideration. If your request is more complex, or there are aspects of your application that are outstanding or need development, it can take longer. Please factor in these timeframes for funding your event or project. We will let you know as soon as possible if your application is not eligible for Lotterywest support, not ready to progress or hasn’t provided enough time for us to assess it before you need an outcome. How likely am I to be successful? Lotterywest approves around 1,000 grant applications every year. Our intent is to support your idea if we can. Check out our common grant types to find the one that fits best with your request and then please call us to discuss and get some guidance from our team members before you submit an application. There are no set limits on how often you can apply. We consider the need for the request and the benefit it will support. Please call us if you plan to make multiple applications in a year so we can work with you on how best to do this. How do I show ‘good governance’? How much information should I provide? There's no limit to the amount of information you can provide, although we encourage you to only provide the necessary level of detail. Your application will be assessed by a member of our team who then makes a recommendation to the Lotterywest Board. Our Board reviews all grant recommendations. A final recommendation is then presented to the Minister for Lotterywest for approval. Can I submit a joint application with another organisation? Of course! However, one of the organisations will need to be responsible for each application and be the applicant. Can I apply for another grant, if I haven't acquitted the last grant yet? Short answer: yes! We will need to consider what stage your previous grant is at, and why it hasn't been acquitted. Any decision on a new grant request will take this information into consideration. What about my GST status? No matter what your GST status please don’t include the GST in your request. If your organisation is not registered for GST and would find it difficult to pay the tax, please call us to discuss. What do we mean by a delegated signing authority? Lotterywest grant conditions and agreements must be signed by the person legally able to enter into contracts on behalf of your organisation. We refer to this person as the legal signatory. Your organisation’s constitution or equivalent document usually sets out who the legal signatory is. Please check those documents if you are not sure. If your organisation’s legal signatory chooses to give this responsibility to someone else within your organisation we refer to the person nominated for responsibility as the ‘Delegated Authority’. If this is the case for your organisation, you need to complete our Delegated Signing Authority Form. Please note: you only need to complete this form once and it will remain on our records for future grant applications. You will only need to complete this form again if your ‘Delegated Authority’ changes. Can Lotterywest help me prepare my grant application? We can’t prepare an application for you, however a member of our team will be happy to talk about your proposal and provide information to help you develop the application. It is important that you call us to discuss your idea or project and any questions about applying before you apply. Lotterywest provide written advice on the outcome of all applications. If your grant is approved, we will advise you of payment arrangements and our requirements for acquitting the funds. You can track the status of your application in the portal. Once a grant is approved, we'll send you a letter advising what has been approved and any outstanding requirements for payment to be made. Grants are paid through an electronic funds transfer. Please ensure that the bank account details provided are your organisation’s main operating account and that these are always kept up to date in the portal. How do I acquit my grant? All organisations who receive our support are accountable for the expenditure of a grant within a given timeframe. Our grant acquittal processes are very simple and are explained once your grant is approved. It’s important to read your grant approval letter. Can I acknowledge Lotterywest support? Yes, we would appreciate publicity of your grant, although the potential for this in no way influences our assessment. Most organisations are happy to acknowledge the support Lotterywest has provided and we know that this can also be of benefit to your organisation. Your grant approval letter will detail whether or not we have asked you to acknowledge our support. What happens if my project or organisation details change? Please advise us if the details for your grant project or any of the people involved have changed. We can work with you in responding to any differing or changed circumstances. You can update your organisation's details such as bank account, GST status or contact information in the portal at any time. To update your organisation's contact details, go to the ‘Edit Account' section. Can I request that a grant recommendation be reviewed? Yes, the request should be made in writing to the Lotterywest CEO and signed by your organisation's Chairperson or authorised delegate within 60 working days of receiving formal advice of the decision. Please include the reason for the request and what you seek as resolution. We will advise you of the outcome as soon as possible. A request will not impact on the consideration of any future applications. Can I get feedback if my proposal is not successful? Yes, you will receive feedback along the way from the member of our team who is assessing your application. Our team focuses on building relationships and we are always happy to talk about your needs and ideas. Which grant type do I apply for? Our range of grant types (below) gives you an idea of what Lotterywest can support and what they cover. If your idea doesn't fit one of these categories or your request covers more than one grant type, please contact us. Where can I find the payment request form? Complete and submit your application. You can attach documents (from your computer). You will receive an email with a PDF version of your application; you can then track your application online. In some cases, requests for different grant types can be grouped together in one application. Please contact us about how best to progress if you are planning to submit more than one application within a short timeframe. Can I save a draft application and return later? Yes, can select 'save draft' at any point and leave your application. When you return to your landing page in the portal you will see your application in your incomplete tab, you can then select 'continue application'. How can I keep track of my application? When you submit your application you will receive an email containing your application number and a PDF copy. You will be able to track the progress of this application on your landing page in the portal. Should I save a copy of the application that I have submitted? Yes, when you submit your application you will receive an email containing your application number and a PDF copy. Can more than one person work on an application? Yes, multiple users can log into the portal and do some work in the same application. We suggest that only one person work on the application at any one time. How do I use the form with different operating systems and web browsers? We encourage you to use these browsers when using the portal. If you notice any issues with the portal on your specific browser, please notify us. What is the Lotterywest Grants Application Portal? The Lotterywest Grants Application portal replaces the Adobe Grant Application Forms. The Portal enables you to register your Organisation online with Lotterywest. You will then be able to log in and update your details with us at any time. You can complete and submit applications, including attachments, and track the progress of your application. You can also see your grant history if you have had a previous grant. To reset your password, click on the ‘Forgotten Your Password?’ link on the portal login screen and follow the instructions. What happens if my internet connection disconnects whilst I am working in the portal? Your work will be automatically saved as you progress through the portal. Unfortunately any data that was not saved on the current page will be lost. However you will be able to continue your application once your internet connection is re-established. Can I see my application as a whole or print it before I send it through? No, applications cannot be previewed as a whole or printed before submission. You will receive a PDF copy of your application by email following submission. Yes, before submission you can select 'withdraw application' from your landing page. If you have already submitted then contact us to arrange to withdraw your application. Once I start an application in the Portal, how much time do I have to submit? There is no time restrictions in the Portal. You can start, complete and submit your application at any point. Lotterywest receives all application types throughout the year. When using the Portal can I work on more than one application at a time? Yes, there are no restrictions in the portal on the amount of applications you create at any point in time. Please contact us about how best to progress if you are planning to submit more than one application within a short timeframe. Choose a consultant who is recommended by others and has a proven track record in providing relevant, high quality advice. They should also have the ability to offer fresh ideas and someone who understands your organisation, its work and values so that they may add value by sharing and building skills with your staff. We can help with the cost of engaging a consultant, for details please refer to our organisational development grants. You may also want to explore options for pro bono (free) or discounted consultancy support. We’ve developed a Directory of Consultants to help you look for consultancy support to suit your project. The Lotterywest Directory of Consultants provides details of consultants, together with referees, who’ve provided services to other community organisations and/or local government authorities in a range of areas. The inclusion of a consultant in the Directory is not an endorsement of their work by Lotterywest. It is up to you to do your own research to decide whether a consultant is suitable for your project. You do not need to use the services of one of these consultants for your project to be supported. We welcome your feedback to help us keep the Directory current and useful. Common Use Agreements (CUAs) are whole-of-government standing offers. They are awarded to a single or panel of suppliers to provide goods or services commonly used by government agencies. Western Australian public authorities, other government entities, local government authorities and registered Public Benevolent Institutions can buy from CUA suppliers. Your organisation may be in a position to benefit from CUA arrangements. Find out more at Contracts WA. The Connecting Up Suppliers Directory connects Not-For-Profit organisations with IT providers. Visit Connecting Up for more information. How can I be listed in the Lotterywest Directory of Consultants? We’ve developed a Directory of Consultants to help our grants customers look for consultancy support to suit their project. The Lotterywest Directory of Consultants provides details of consultants, together with referees, who’ve provided services to other community organisations and/or local government authorities in a range of areas. The inclusion of a consultant in the Directory is not an endorsement of their work by Lotterywest. It is up to Grant Customers to do their own research to decide whether a consultant is suitable for their project. Grant Customers do not need to use the services of the consultants in the Directory for their project to be supported. We welcome your feedback to help us keep the Directory current and useful. If you are a consultant wishing to be considered for inclusion or if you want to update your details, contact us at: consultants@lotterywest.wa.gov.au or call us. How do I create successful partnerships? Partnerships between organisations can deliver improved outcomes from streamlining administrative tasks and shared workspaces to working together to deliver a community project. We often achieve more when we work with others. Many organisations say that their best partnerships have created opportunities and results never imagined when they started working together. The information below shares ideas to help you create successful partnerships. There are many forms of partnership. For the purpose of this section, we are referring to a relationship which endures for a period ranging from a few months to several years. Partnerships often develop between community organisations in the same sector working together to deliver better services, share facilities or combine administration functions. Community-business partnerships develop when a community organisation works with private business to raise funds, build capacity, share work spaces, increase opportunities, improve outcomes or achieve other goals. Community organisations can also form partnerships with public sector agencies. This is most common at local government level however they are also developed at State or Federal level. How do I get the right support to turn my idea into reality? Financial and in-kind support can help organisations transform their idea into reality. Getting the right support for your project can mean bringing in more financial resources, new expertise, contacts and in-kind support. The information below has some questions for you to consider and tips for gaining external support. Generally we would not expect to be the only source of funding for your request, even though we may be the major contributor. We also anticipate that most organisations will make a contribution from their own resources, whether financial or in kind. We are able to work with you to offer ideas for other resources and relationships that you may be able to source to make your project more viable. Why do we think this idea will make a difference to our community? Are we sure that in all likelihood the project will work, and difference it will make, are worth the time, effort and money it will require? Would other ideas be effective? What makes us the best organisation to receive support for this? Are there other organisations we could work with on this? Do we have the skills and resources to do this properly? Is this project viable or sustainable? What might go wrong and prevent this project being completed or being effective? How can we reduce and manage risks? What are the most appropriate sources of funding? How do I effectively manage my assets? There are many ways to manage assets and we are not the experts. Whilst this resource may help you to get started, please use whatever approach works for your organisation. If you are applying for a grant towards the purchase or creation of an asset, you may need to show how you will manage this asset. Even if this isn’t needed for a grant request, deciding how you will manage your asset is important. We can also help you with the cost of organisational development activities such as asset management training. For further details please refer to our organisational Development grants. How do I plan well to meet my objectives? Ultimately good planning provides an integrated and unified way to deliver your business objectives. It’s important to document strategies you’re planning to use to help achieve your outcomes. You’ll also need to identify an ongoing method to evaluate and monitor your progress. To keep your eye on the ‘big picture’, an effective way of reporting is essential. Reporting will allow you to review your progress and ensure a considered approach to decision making. Many organisations will already have sound planning processes in place and won’t need this resource. It is offered as a tool to help those getting started. There are many models and approaches to planning and we don’t assume to know what is best for your organisation. Please use whatever approach works for your organisation. When considering a request for a grant e.g. towards a complex project, we need to be confident that it has been planned appropriately. While you may not be required to submit your organisational or strategic plan to receive a grant, the planning processes of defining and responding to problems, consultation and analysis are intrinsically valuable to your organisation. Which online directories may assist me in developing my grant idea? The WA Department of Local Government and Communities’ online grants directory provides information on a wide range of grants available to communities and local governments. The Pro Bono ‘Source’ Directory provides national goods and services information for the not-for-profit sector. The Connecting Up ICT Suppliers Directory provides details of Information Technology consultants, and suppliers. Contracts WA provides information on Western Australia's whole of Government contracts, known as Common Use Agreements (CUAs). Local Government Authorities and registered Public Benevolent Institutions can request access to the CUAs. What other scholarship programs are available for the not-for-profit sector? Starting in 2017, up to 25 fellowships will be awarded annually for the next 20 years, to develop some 500 social change agents, influential leaders and innovative thinkers. Find out more here. Scholarships assist participants to attend not-for-profit courses run by the Institute of Company Directors across Australia. Find out more here. The Australian Institute of Management WA recognises the work of not-for-profit organisations and aspiring professionals in the community wishing to embark on professional development by providing training up to the value of $4,000 that can be used to fund participation in any of the Open Programs offered by the Institute. Find out more here. The Australian Scholarship Foundation(ASF) provides access to free or substantially discounted executive management, mentoring and training programs in a range of management disciplines to directors, staff and volunteers of not for profit organisations through its scholarship programs. Find out more here. This program allows qualified CPAs to volunteer their time and expertise to mentor treasurers of small not-for-profit organisations. Find out more here. The Fulbright Professional Scholarship in Non-Profit Leadership provides an opportunity for an emerging leader in the not-for-profit sector to undertake a program of research and/or professional development in the U.S. with an approved U.S. charitable organisation. Find out more here. Scholarships allow participants to attend the renowned Harvard Business School course titled “Strategic Perspectives in Non Profit Management” (SPNM) held in July each year. Find out more here. Provides details of graduates and Fellows that may work on a pro-bono basis to help not-for-profit organisations work strategically. Find out more here. Scholarships are available for leaders of not-for-profit organisations to visit and research best practice social innovation projects/ sites in their field. Find out more here. Scholarships are available to build capacity in community organisations by offering training and business education to talented management staff. Find out more here. Scholarships aim to improve the quality of leadership and management skills in the Australian not-for-profit sector. Find out more here. Scholarships provide financial assistance to students enrolled in the Graduate Certificate in Social Impact at UWA and currently working in the not-for-profit sector. Find out more here. What other funding or finance sources may be available? Other support may come from a range of sources including government, agencies, philanthropists, corporates, local governments, crowd funding, financing arrangements and your own fundraising activities with individuals and the community. The Department of Local Government has developed an online grants directory to help communities and local governments in regional and metropolitan Western Australia in locating sources of financial assistance for their projects and initiatives. It may be appropriate to seek a loan or leasing arrangement to help meet some of the costs of your project. Banks and other financial institutions will often support not-for-profit organisations with financing solutions for capital items such as buildings, information technology or vehicles. You may want to talk to your own bank first to discuss what financing options might be available to your organisation and then see what other options may exist from other providers. What is a technology needs assessment? A Technology Needs Assessment (TNA) provides your organisation with the information needed to make decisions about investment in technology. A TNA should establish a clear link between your organisation’s strategic plan, proposed technology and the business outcomes required. The TNA should outline what your organisation does, what else needs to be done, and how newer technology will help your organisation achieve its goals. A staff member may undertake the TNA for your organisation or you may engage an external “expert” to provide information about the possibilities technology can offer based on the needs you identify. How to Create a Technology Needs Assessment and Planning Your Technology Initiatives are helpful online resources to guide you through the development of a TNA. We encourage you to use these, along with other information you may source, to guide you through the development of a TNA. Are there any other sources of information I can refer to, such as industry bodies? What is the term of the Lotterywest Agreement? The retailer is appointed until 31 December 2031. For more information, click here. Is the Agreement a franchise? All Lotterywest retailers operate under a formal Agreement that is specific to the owner, location and business type. Lotterywest retailers do not operate under a franchise. For more information, click here. I want to buy a business that currently has a lottery outlet. What do I need to do now? You will need to approach the owner to submit an offer to purchase their business. Can I sell my store that has a lottery outlet? Yes. We suggest signing an Offer and Acceptance subject to Lotterywest approval. For more information, click here. We require 30 working days to progress a complete application which you should consider when negotiating a settlement date. What are the rates of commision paid to Lotterywest retailers? Commission rates vary by product, ranging between 7% and 9%. Detailed commission payable by product is available in our Retail Manual. Can Lotterywest help with leasing? We can help by giving details of lease negotiators who may be able to assist, and confirming with you your options under your Agreement. Please contact us and ask to speak to a member of our Retailer Support team. I'm an existing retailer and my business structure has changed. What do I need to do? Please send an email to retail-admin@lotterywest.wa.gov.au confirming the change to the legal structure of your business. A member of our Retailer Support team will be in contact with you. What fees and charges do I have to pay? An Application fee of $1,300 is applicable when purchasing an existing lottery outlet. Ongoing fees and charges also apply. The full schedule is available in our Retail Manual. How is the money for lottery tickets I've sold collected by Lotterywest? We operate a direct debit banking process to settle amounts due for the weekly direct debit. More information is available in our Retail Manual. How much does a shopfit cost? Lotterywest can provide you with a list of various buildings and shopfitters from which you can obtain a competitive quote for your Lotterywest shopfit. Please call us for more information. What are the retail image standards? Maintaining the retail image helps identify you as a retailer, attract customers to your store, inform them about our products and as a result, optimise your sales and strengthen brand recognition. You can find out more under section 3 in the Retail Manual. Why is my retail image important? Having a high standard in your retail image will help you optimise sales and improve the instore customer experience and qualify for various rewards and incentives. How are the retail image standards assessed? Lotterywest carries out routine Retail Presentation Standards assessments at all of our stores either by photos or visits. Stores are assessed against a number of key elements from displaying current point of sale through to ensuring that all Lotterywest equipment is functioning correctly. How is the retail image maintained? In addition to having regular Retail Presentation Standards assessments, Lotterywest provide a self-assessment checklist which outlines all the key areas that are evaluated as part of your regular assessments. What are Lotterywest's terminal operating hours? Lotterywest terminal operations are available 24 hours a day, 7 days a week*. What support hours do Lotterywest operate? Support hours can be found here. What are the terms and conditions of becoming a Lotterywest retailer? - The Guarantee and Indemnity Agreement Terms and Conditions outline the obligations of the guarantor(s) where the legal entity comprises of a company or companies. - The Retail Manual details current operating procedures, business management, customer service and retail presentation standards that retailers are required to comply with. Why are we undertaking the Retail Distribution Plan review? We’re currently reviewing our Retail Distribution Plan to ensure we’re choosing the best locations for new Lotterywest stores. While this review takes place, the State Government has endorsed an Interim Retail Approval Process for Lotterywest. The interim process considers factors such as the position of proposed outlets and impacts on existing outlets, player access, revenue and new retail areas. If you have any questions, or want to find out more about the availability of certain locations, please contact us on 133 777 and ask to speak with a member of our Retail Network Planning Team. I would like to become a Lotterywest retailer - how do I go about this? There are two ways to enter our network, either by establishing a new outlet or purchasing a business that already has a lottery outlet. Please click here to access more information. What is the process to establish a new outlet? Information on how to establish a new outlet can be found here. Where is my nearest Lotterywest store? Use our handy find a store locator to search for your nearest Lotterywest store. Does Lotterywest grant territorial exclusivity? Lotterywest does not give retailers any territorial exclusivity in relation to the sale of lottery products and has full discretion in relation to the number and location of lottery outlets. What support will I get as a Lotterywest retailer? Your success is our success and together we make a difference to WA. That's why it's important that our retail network performs optimally and efficiently and is sustainable long term. So that we can reach our business potential and support you to reach yours, we offer great initiatives to help you grow your business. What training do I need to do? Information regarding training requirements can be found in section 2 of our Retail Manual. There is no cost for training. What types of rewards programs are available to retailers? Rewards 4 Growth is an annual rewards program providing incentives to retailers who improve their total sales performance. The program is split into quarterly periods, providing four opportunities to earn rewards throughout the financial year. Sales Sprints run in conjunction with the annual rewards program. They offer a variety of reward types and focus on specific Lotterywest products and selling behaviours. What development events are available to retailers? The Lotterywest Retailer Conference is held every two years and is our premier professional development day for retailers. The event agenda includes important business updates from Lotterywest, interactive master classes and presentations from nationally recognised retail industry experts. Workshops are suitable for owners, store managers and staff. These interactive sessions are customised to best suit your business, providing you and your team with practical skills, knowledge and tools to enhance workplace performance.